On behalf of MisterX6 we’re pleased to offer you KFSO. This is a highly detailed scenery of San Francisco International Airport, as well as the city of San Francisco. Donations allows MisterX6 to keep making sceneries. If you enjoy my work, consider making a contribution. Donations are always optional, but greatly appreciated. Ok, here’s the donation link. – Copy all four folders into your „X-Plane 10/Custom Scenery“ folder. Scenery load order in X-Plane 10 is defined by the file „scenery_packs.ini“, found in your „Custom Scenery“ folder. 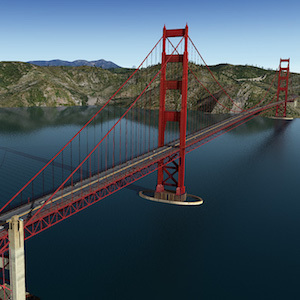 Make sure this scenery package is higher up than „Global Airports“, HD Mesh, or any other scenery package for the San Francisco area. If you fail to do so, the scenery may not appear correctly. The package is compatible with HD Mesh V3. It’s also compatible with „Runways follow terrain contours“. This option can be left on. If you are running other scenery packages for this area, please refer to the „Scenery load order“ section of this manual. This scenery package is for personal, non-commercial use only. Redistributing this scenery or any part of it is prohibited. For further information, please contact me. USGS-authored or produced data and information are considered to be in the U.S. public domain. Credit goes to U.S. Geological Survey, Department of the Interior/USGS, U.S. Geological Survey.